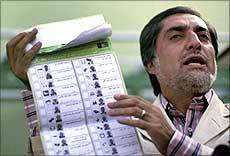 Warning of 'shocking scale' of vote rigging in the Afghan Presidential elections, the main challenger to Hamid Karzai has said the poll fraud will remove all legitimacy from the new government. "If the democratic process does not survive, then Afghanistan does'nt survive," former foreign minister Abdullah Abdullah said, as allegations of vote frauds gathered momentum with only days left for announcement of the outcome. Abdullah's warnings come as United States and its western allies who initially had welcomed the elections as movement towards normalisation in Afghanistan through the ballot, have raised concerns about the legitimacy of the outcome, as early results point to a dismal 30-35 per cent turnout. The former Foreign Minister in an interview to British newspaper the 'Daily Telegraph' said he would examine all legal avenues against what he termed as "state engineered election frauds." "And if that was unsuccessful," Abdullah Abdullah said he would refuse to recognise the outcome. Election officials in the backdrop of such warnings by him and other Presidential aspirants have said that they have contingency plans to deal with any "Iran-style" protests. With 17 per cent of the results released, Karzai has a narrow lead over Abdullah by 42.3 per cent to 33.1 per cent. The winner needs 50 per cent plus one vote to sail through in the first count, otherwise the polls go to the second round. As the cries of poll fraud increase, French foreign ministry have called a meeting of envoys of France, United Kingdom, Germany and US to meet in Paris on Wednesday to discuss the Afghan election. The White House has also condemned any acts of fraud in the elections as its Special Envoy Richard Holbrooke had a verbal duel on the issue with President Karzai. Abdullah Abdullah told the British paper that Afghan Election Commission had to take notice of complaints of fraud, "because what does that mean? The same sort of regime that crafted this massive rigging will be imposed upon Afghanistan for another five years." The former foreign minister last week had presented to the media what he claimed was frauds committed by Karzai supporters and said it remains to be seen whether the election commission was strong enough to disallow suspect votes and ballot boxes. Dr Abdullah said the international community was concerned that the drawn-out elections could worsen security, but denied he had come under pressure to make a deal with the government and avoid a lengthy battle. He said, "They cannot pressure me to be part of a mafia system, a 'narcostate' as they themselves defined it."